Oh I love teaching the Book of the Dead in both AP Art History and Humanities because it allows us to dive into thoughts of the afterlife, Ancient Egyptian funerary traditions, and the Egyptian pantheon. All topics my students find fascinating. Many main Egyptian gods appear in this scene of the Book of the Dead so it is important to cover who the gods and (briefly) their roles in Egyptian religious life. I am going to describe the gods from right to left based on the picture above. Anubis is the jackal-headed god seen leading the dead man, Hu-Nefer. He is the Egyptian god of mummification and the transition from life to death so it makes perfect sense that he is the god to be leading the man to the afterlife. You can see that Anubis appears twice here, first leading Hu-Nefer and secondly sitting under the balance. Ma’at is the goddess of truth, balance, order, and law. Here she is symbolized as the balance with a head on top and she is also the feather on the scale. The dead man puts his heart on scale and it is weighed against the feather of Ma’at. If your heart is heavier than the feather then you are punished by getting your heart eaten by the next god, Ammit. Ammit is the god sitting underneath the scale. She is one-third crocodile, lion, and hippo (the three fiercest animals along the Nile). 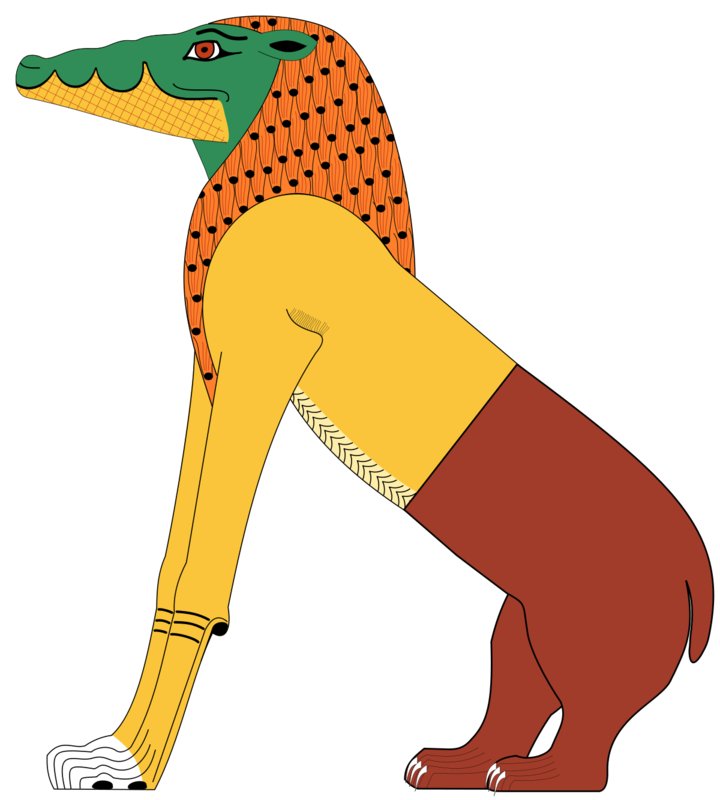 Instead of going to heaven or hell like the Christian tradition, Ancient Egyptians believed you either existed in the afterlife of paradise or your soul ceases to exist because Ammit eats it. Of course the Book of the Dead would NEVER show this outcome because it is supposed to help you get to the afterlife. Thoth is the god right after the scale and is seen writing. He is the god of magic and writing, which to us today it seems like a weird combination but you have to remember that in Ancient Egypt very few people could write to the ability to write and so reading was seen as magical. Thoth very diligently marks down who makes it to the afterlife or not, he is so erect we trust he is getting it right. He has the head of an ibis, as seen here, but sometimes seen as a baboon. Read more: What is a Book of the Dead? Horus, the falcon-headed god, is the protector of the pharaohs. Once the dead makes it past the judgment seen Horus presents them to the god of the underworld, Osiris. In front of Horus are the “four sons of Horus,” the four little statues who are also on the canopic jars (jars in which the dead person’s four important organs are kept). Horus also appears twice in this Book of the Dead, the second time he is symbolized as a falcon and “Eye of Horus,” this is another story about Horus that is not necessarily important here. Osiris is the father of Horus and the god of the underworld. There’s a wonderful story about Osiris being killed by his brother Seth and thereby becoming the first mummy, later the Lord of the Underworld. That is why he is seen here under the special canopy seated on a throne covered in linen strips with green skin. To showcase his power and authority, Osiris hold a crook and flail and wears the white crown of Lower Egypt. Behind Osiris are this two sisters, Nephthys and Isis (also the mother of Horus), they are in a traditionally feminine position behind Osiris. Nephthys is known as the goddess of the underworld and is seen as the opposite life force of her sister Isis. Underneath the canopy of Osiris is a white slate that represents natron, the salt that is used to dried out the bodies of mummies. And on top of the main scene of the Last Judgment is Hu-Nefer proclaiming in front of many gods that he has not committed any of the forbidden sins. Although hard to see, many of the gods hold ankhs, symbols of everlasting life in Ancient Egyptian, entirely appropriate here. Whew, that was a TON of information! There is a lot conveyed in this piece but it really opens the door to understanding ideas of the Ancient Egyptian afterlife. **Note, in AP Art History I ONLY cover these Egyptian gods because we are short on time but in Humanities I cover more Egyptian gods because its fun. Next Time: #25 Lamassu from the citadel of Sargon II, Dur Sharrukin (modern Khorsabad, Iraq). Neo-Assyrian. c 720-705 BCE.